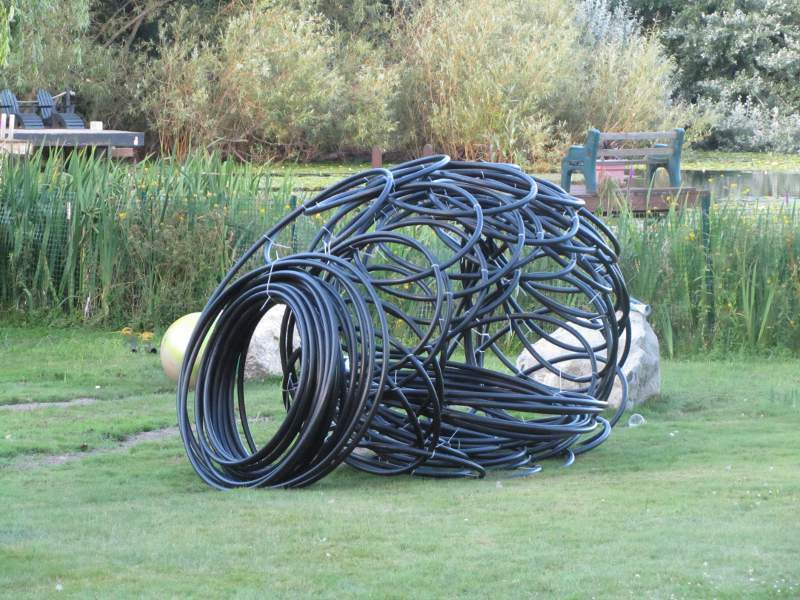 Naeem made his own slinky loops by following our instructions. 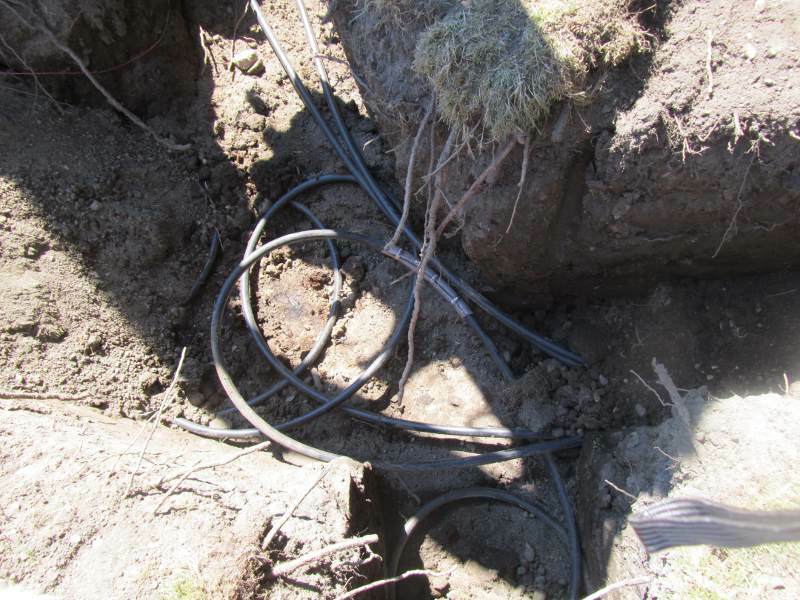 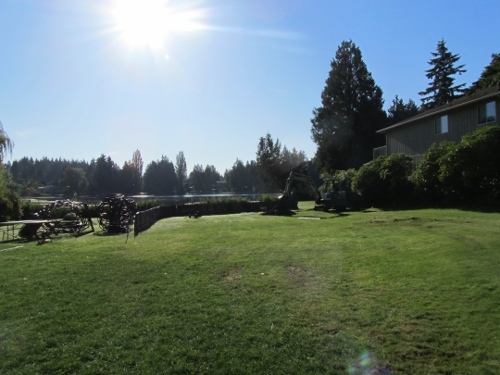 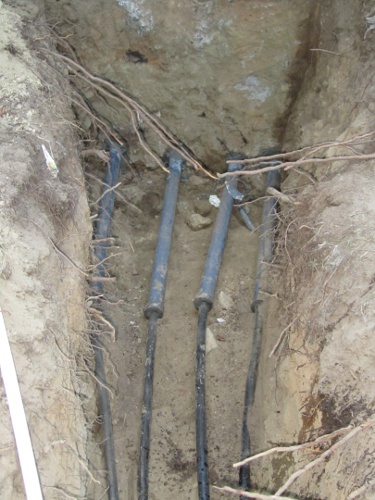 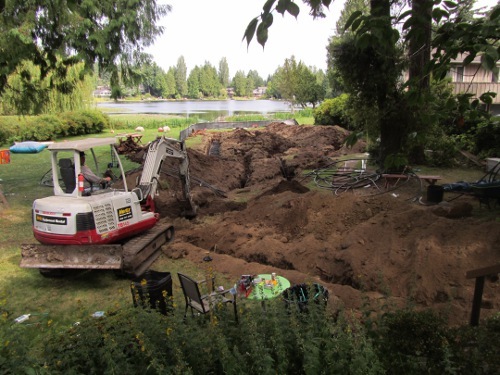 He used 800-foot lengths of 1-inch HDPE DR-11 pipe. Before digging, he made sure the slinkies would fit where he was planning to dig his trenches. The trenches are 100 feet away from the basement wall, so some of the pipe will be buried as a straight length. Normally we don't use slinky loops, because they aren't as efficient for heat transfer, but Naeem has saturated soil and a lot of underground water flow, so a slinky works for his conditions. The trenches are 4-feet deep and 3-feet wide. 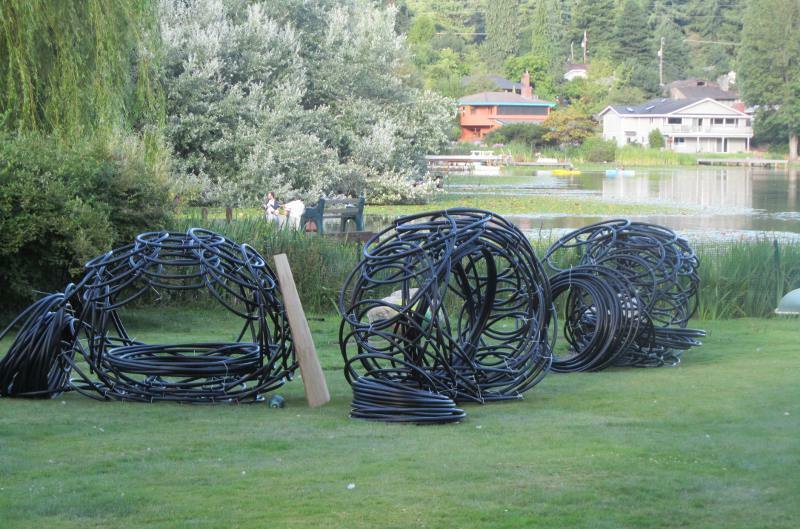 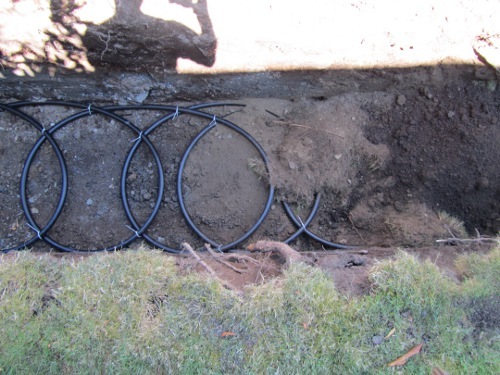 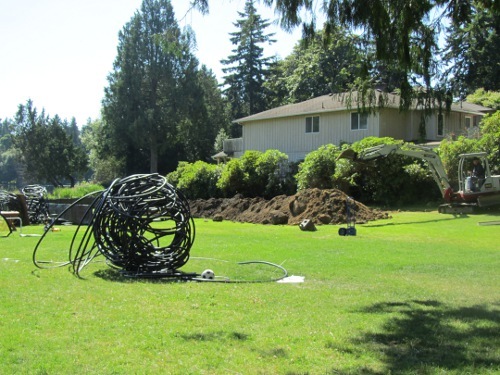 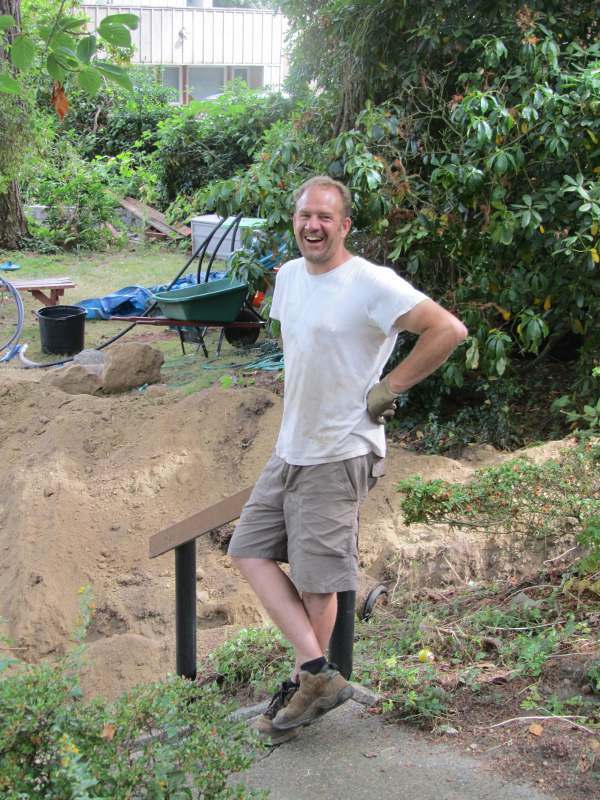 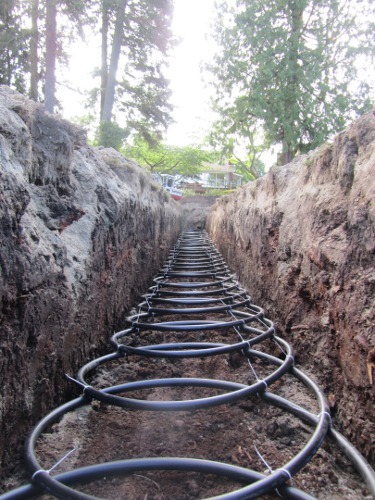 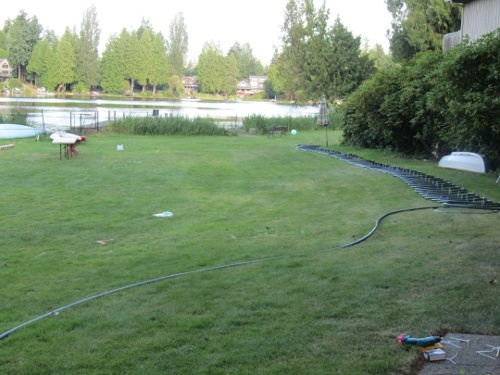 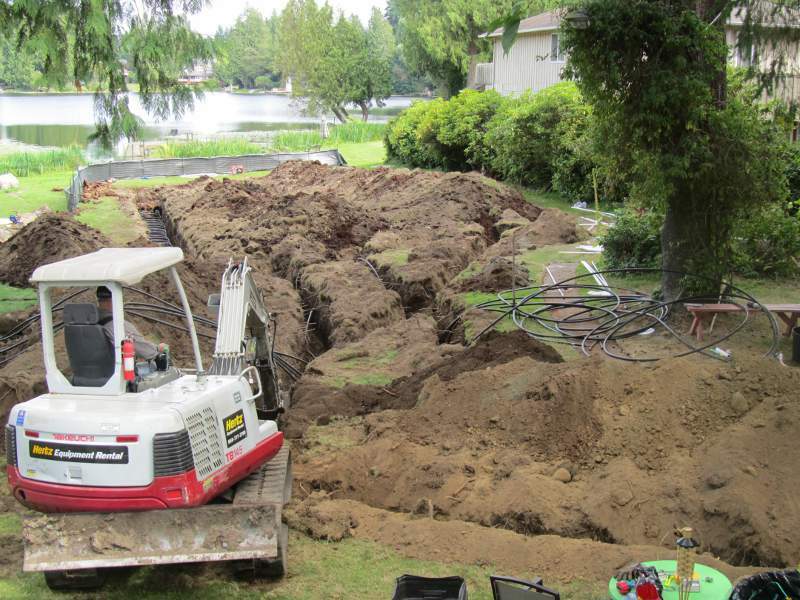 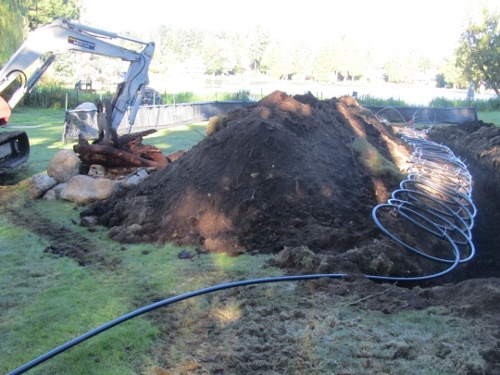 These slinky earth loops service a 3-ton geothermal heat pump. 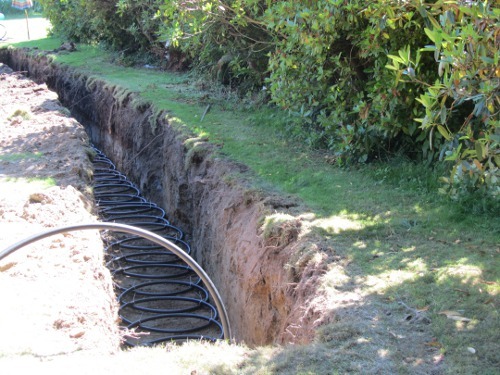 Since they are buried in saturated soil, we only needed 85-lineal feet of trench per slinky loop, times 4 trenches. 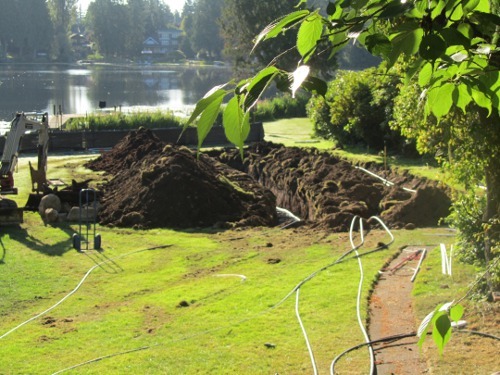 If there had been enough room for 115-foot trenches, we could have gotten away with installing 3 slinky loops. 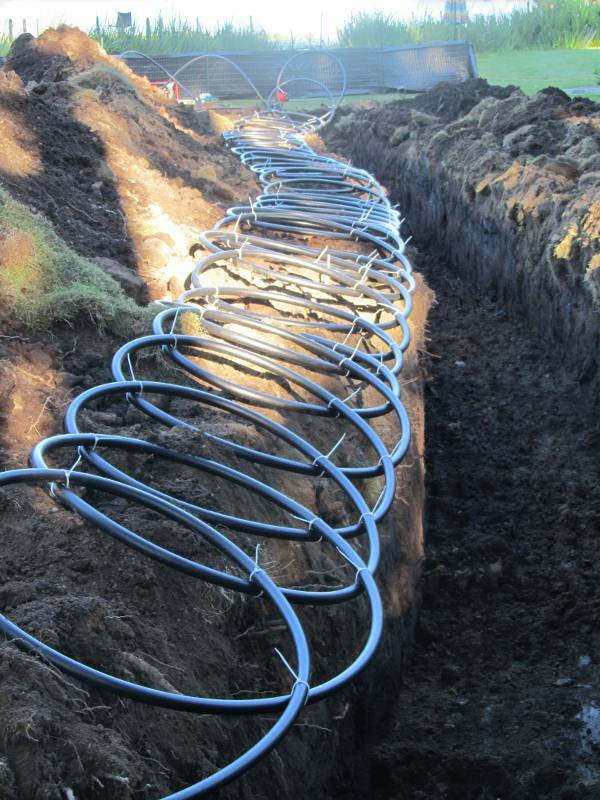 If the soil had been damp clay, we would have needed 3 slinky loops, each 185 feet long, to transfer the same amount of heat. 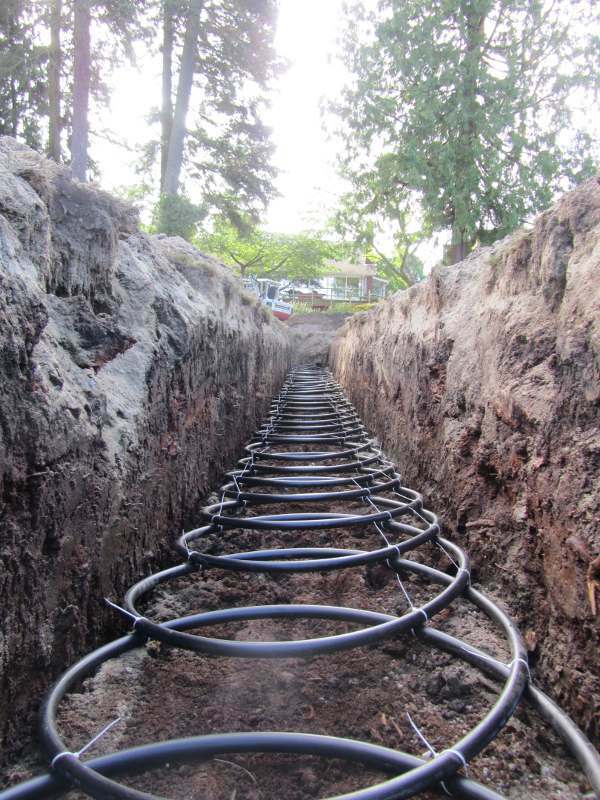 Ready to lay the slinkies in the trenches. The straight runs of pipe from the slinkies will be buried in narrower trenches, but these haven't been dug yet. 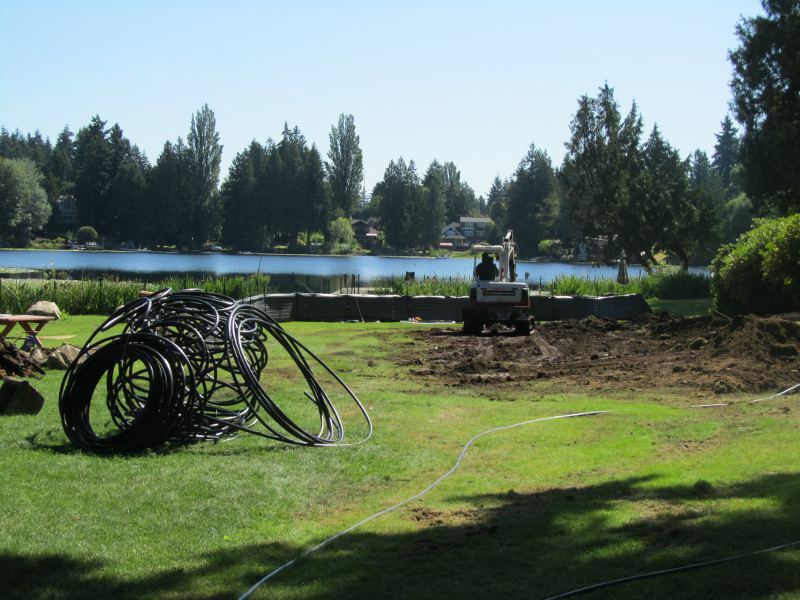 Grading the yard over 2 of the buried slinky loops. 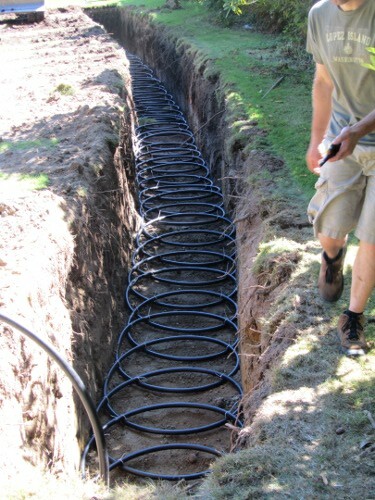 Here's the narrow trench for the return lines coming from the third and fourth slinky loops. 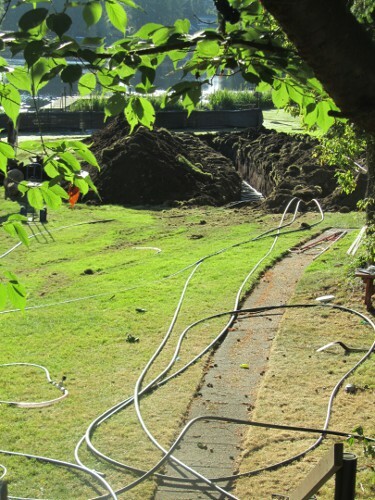 Continuing the trenches for the straight supply and return lines to the house. 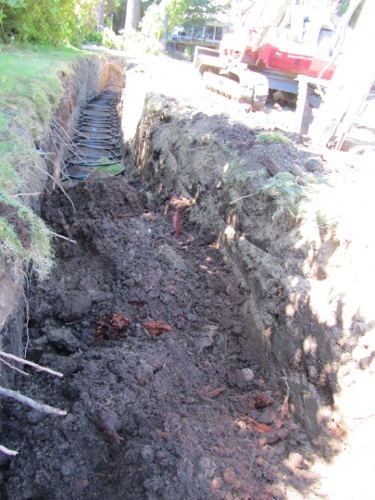 You may be wondering why we say this is saturated soil, when there is obviously no water to be seen in these trenches. This soil is normally so soaked with water that it seeps out of the ground on the hill down to the lake. 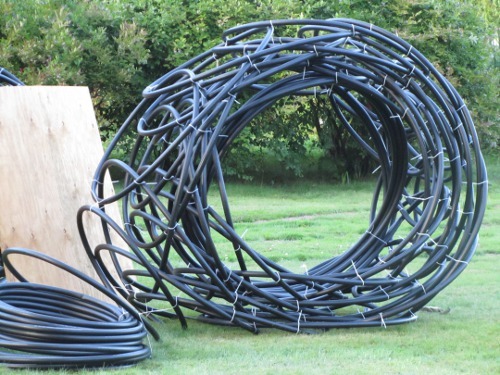 Trying to dig under those conditions would be a disaster, so Naeem waited for the end of August, the driest time of the year, to put his loops in. 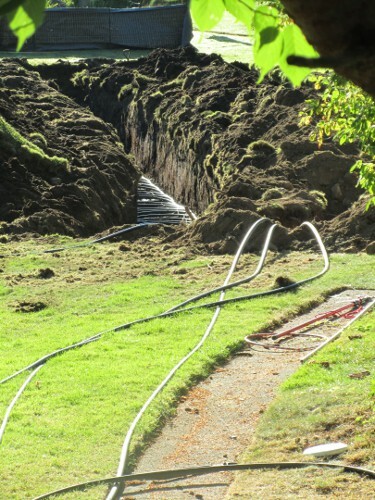 That's why there's no water laying in the trenches. 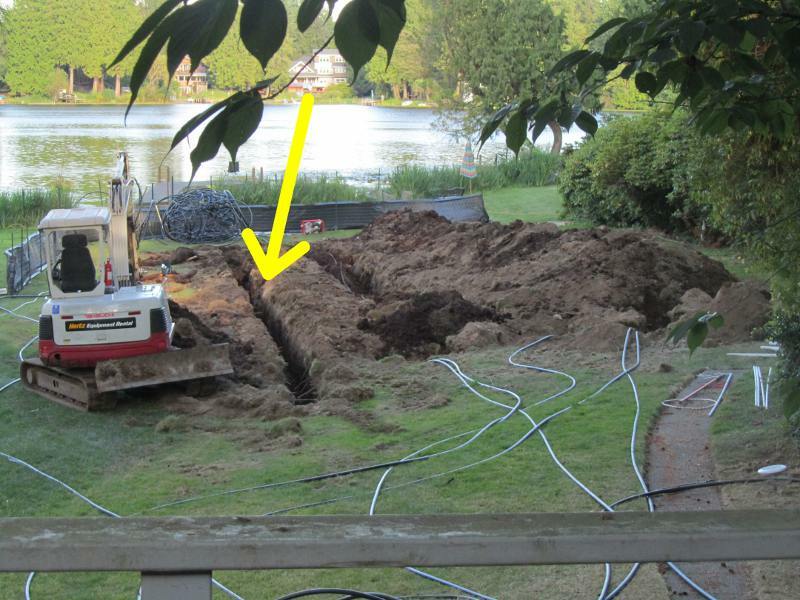 The 4 supply lines coming from the basement. The supply line trench and the return line trench are 8 feet apart. 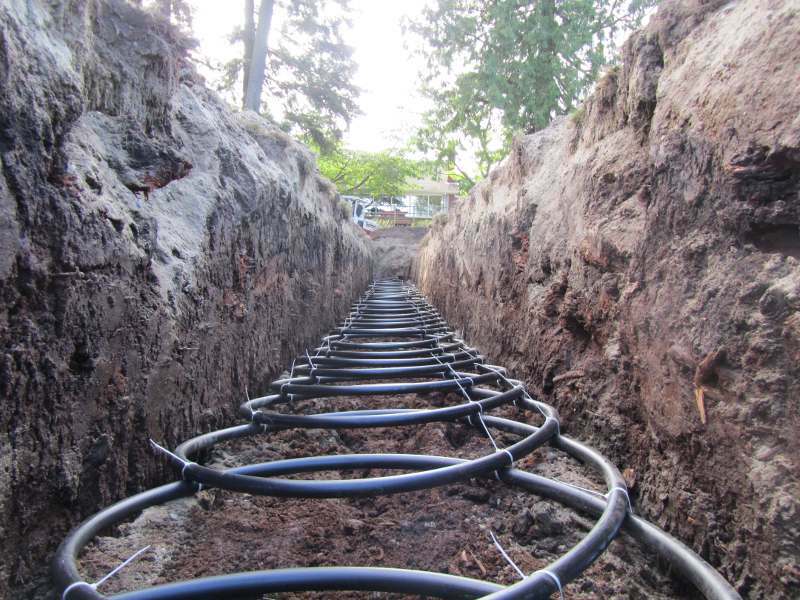 Each supply line penetrates the basement wall through a 2-inch PVC wall sleeve, sealed with a rubber seal. 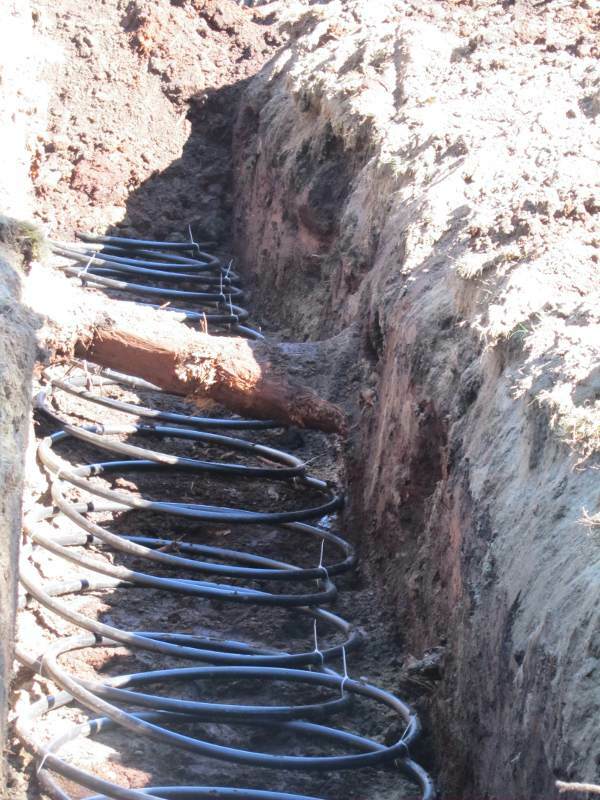 The return lines are installed the same way, in another trench 8 feet away. 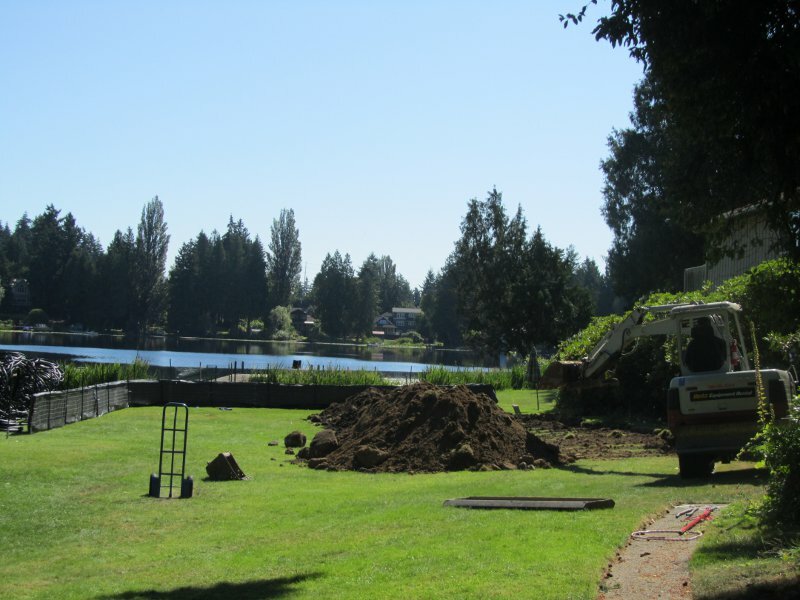 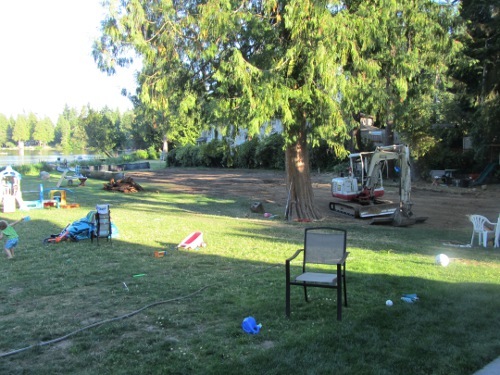 The earth loop is buried and the yard is graded.